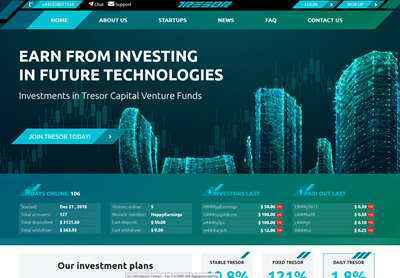 Tresor Capital LTD is an independent investment company, established in 2018 that united experienced professionals from several British and foreign venture capital funds. The secret to the success of the venture financing is that one successful investment can bring no less and often more income than the rest of the investments in the aggregate. We invest assets in projects at the initial stage of their creation. To do this, we have created a wide network of "scouts" who are looking for promising innovative enterprises and startups.